OMG Posters! » Archive Shepard Fairey's "They Live" Poster (Second Colorway Onsale Info) - OMG Posters! 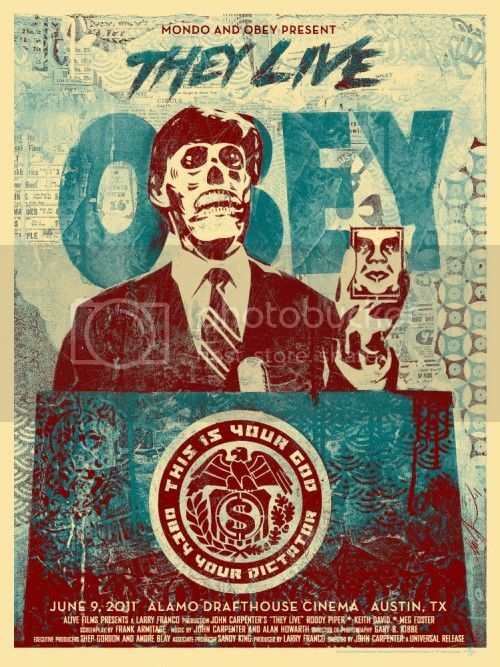 It looks like Shepard Fairey will release his own colorway of the “They Live” poster tomorrow. It’s an 18″ x 24″ screenprint, has an edition of 450, and will cost $50. It goes up tomorrow (Thursday, July 7th) at a random time. Visit ObeyGiant.com. Keep shaking that money tree. Without the shameless “Obey Giant” plug in the center this would be a no-brainer. Sadly, I could care less about this with that stupid card in the middle of the page. Too bad the second edition still includes all the extra text. Of course it includes the text. It’s a movie poster. I got it! It’s the same color scheme as the alien’s faces! I am beginning to think all you haters are just jealous. Just like when you guys get upset with the “flippers.” If you do not like it, just don’t buy it. Does everyone realize this movie is terrible? It sold out again…so he must be doing something right. Stop the hating. If you do not like something, then do not buy it. Had to sneak around work with iPhone. decent poster.. better than quite a few out there. can’t fault an artist for trying to make money. i would love it if tons of people continued to buy my art… 450 pieces at $50 a piece is $22,500. FOR ONE POSTER. I would accept that and keep making other ones like it if they keep selling. Just got one off obey site. Sweet!